One of the garden fountains. Nestled in the heart of Duke University’s west campus is a 55-acre horticultural mecca that just happens to be one of the top public gardens in the United States. The Sarah P. Duke Gardens in Durham, near the Duke University Medical Center, has been a refuge for visitors since the 1930s. 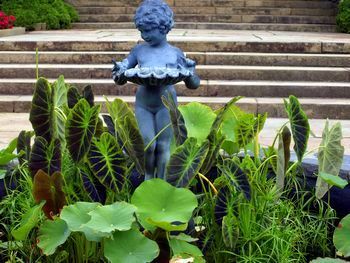 Dubbed the “Crown Jewel of Duke University”, the historic gardens feature five miles of allées, pathways, and walks, and are sectioned into four major parts: the original Terraces, the H.L. Blomquist Garden of Native Plants, the William L. Culberson Asiatic Arboretum, and the Doris Duke Center Gardens. Sarah P. Duke, widow of Benjamin N. Duke, one of the university’s founders, financed the original garden in 1935. After heavy rains flooded the garden, Sarah’s daughter, Mary Duke Biddle, had a new garden constructed to honor her mother. The new garden was designed by Ellen Shipman, a pioneer in American landscape design. Today, it is one of the few remaining examples of Ms. Shipman’s work and is thought of as her best. Visitors come from all parts the world to walk the grounds, where something is always in bloom, and to visit the Doris Duke Center, home to the Harriet Jackson Phelps Horticultural Library and the Triangle Orchid Society. The Terrace Shop and Terrace Café are also on the premises. The Sarah P. Duke Gardens holds community and special events, and offers educational programs for children and adults. Call or visit their web site for info. The gardens are open daily from 8 a.m. until dusk. Admission is free; there is a fee for parking. Accessible and regular parking is available inside of the gardens gate. The Doris Duke Center and many of the garden pathways are suitable for wheelchairs. Trolley tours are available, call 919.668.1705 for info. The Sarah P. Duke Gardens can accommodate weddings and private events. There is also a special Memorial Garden where ashes may be placed, call the center’s Director for details. Note to dog owners, Duke Gardens is a pet friendly place! Well-behaved dogs are allowed on the gardens grounds. They must be on leash at all times and kept out of the plantings. Responsible pet owners must clean up after their pets. Phone: Duke Gardens 919.684.3698; Terrace Shop 919.684.9037; Terrace Café 919.660.3957.